This week we return to the Over The Wall Party aboard the luxury airship Maria. 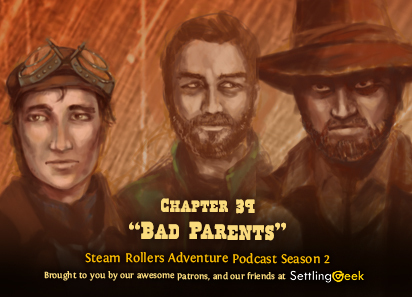 As Oliver sends the kids off for a much-needed nap, Silas and Eugene try to get to know each other when they're not being bothered by Siren Zorma...and then Eugene has a vision. 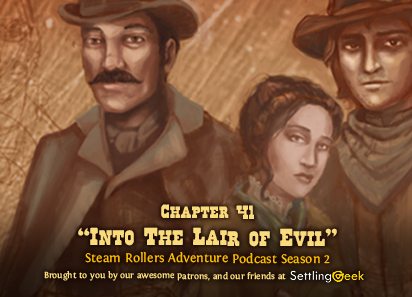 Ep.104 Ch.41 "Into The Lair of Evil"
Percy meets with Dugout, the leader of the Boxcar Boys chapter in Marquis DeLafayette, to enlist the Boys help finding Clarence Roy's estate. Meanwhile, Nigel “Ozzy” Wintermann takes protective steps with Connie before his evening appointment at Fessler Automata. 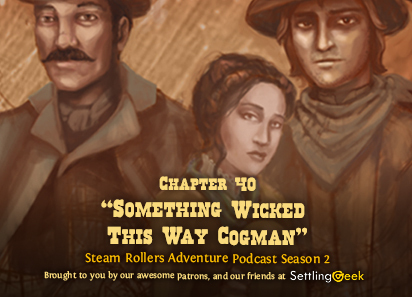 Ep.103 Ch.40 "Something Wicked This Way Cogman"
High over Texas, aboard the luxury airship Maria, Oliver has his hands full as the Trinitykes, Shiloh and Pinny wind up (then down) with excitement. 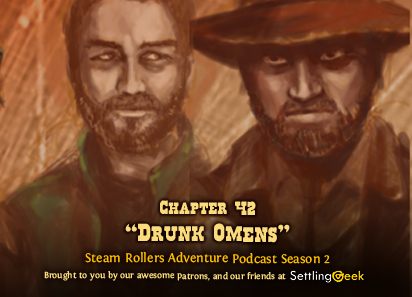 Meanwhile, Silas and Sonny Geffort get drunk, Crazy Rock hands out cookies, and Siren Zorma and Wild Ben Westman are up to no good.